Vietnamese Sandwich is called Bánh Mì in Vietnam, which actually uses Vietnamese baguette, a crisp-crusted light and airy baguette bread, and transforming it into delicious variations of the submarine-style sandwich. After the French left Vietnam in the late 1950s, they left behind Banh Mi as reminders of this part of history. The most common version of Banh Mi features thinly sliced pickled carrots and daikon (known as ðồ chua), cucumbers, coriander, chili peppers, pâté, mayonnaise and various meat fillings. Popular Bánh Mì meat fillings include steamed pork belly, pork chop, Vietnamese ham (chả lụa) etc. We have always wondered why there are no authentic Bánh Mì shops to be found in Singapore to cater for Bánh Mì lovers. That’s why we came up with the original idea to set up Sandwich Saigon in Singapore and bake the freshest Vietnamese baguettes daily from our kitchen, and also cook the fresh meat fillings ourselves, to make the tastiest Bánh Mì for our customers. 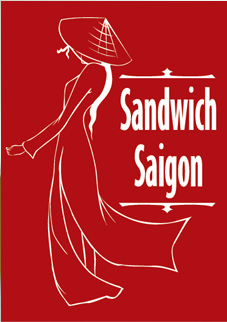 The lady owner Kelly’s family operates a Bánh Mì factory in Vietnam, Sandwich Saigon is based on her family’s recipe to bake the baguettes from the dough that we make from scratch every morning. Our goal is to provide fresh, healthy and authentic Vietnamese food to our customers. We start our day from 5 o’clock in the morning to make fresh dough for baguettes, and use carefully chosen fresh-from-the-market ingredients and top-quality Vietnamese fish sauce to make meat fillings such as Vietnamese ham, pork belly, and the pork chop marinated with the house-made sauce, and the meatball sautéed with the tomato-based sauce, so that our customers can taste the freshness in every bite of the sandwich. Our other signature dishes like Cõm Tấm(broken rice), Phở (rice noodle soup), Buìn (rice noodle), Gỏi Cuốn (fresh spring rolls) and Chả Giò (fried spring rolls) are also using the ingredients imported from Vietnam to maintain authentic and genuine taste.